Started my first semester of seminary. After 2 semesters in, I've completed 17 hrs and have an estimated 3 more years ahead of me!!! Helped evacuees from New Orleans that fled Katrina, then became an evacuee myself when Rita was threatening to hit Houston. Purchased my first major peice of furniture, a couch! Attended my first Baylor Homecoming as an alum! Became an aunt for the 3rd time! Learned that only having 10 vacation days a year is not that many, and a pain to have to plan "time away". Missed several weddings that I wanted to attend, but didn't have the time to get off! Turned 23! 23, can you believe it? Sooooooo old! Went through some scary health stuff with my mom, but finally got that all staightened out around Christmas time. Had a great experience with my first ever "I-term" in January. Finally began developing friends here that I know and trust and that know and understand me...this is priceless. Attended, for the first time ever, the Houston Rodeo!!! Sooooooooo much fun! Moved out of almost all of the Preschool space at the church and into "interim space" rooms (we are very cramped right now!). Moved out of my nice secluded office, into a cubicle that is in one big room with everyone else and mine is RIGHT outside the workroom, so I get all kinds of traffic. Which is fun since I'm a people person, but not so fun when I'm trying to focus and get some work done. Survived my second VBS as Preschool Associate. I think those are the main points, man, pretty lame. But anyways, things are good and I'm all geared up for another semester of seminary, that starts on Monday. Okay, well, I'm in Corpus and need to go get ready for the day and take lunch to my mom! Super Duper: I've had a few days off to spend in Corpus, nice and relaxing before seminary starts up! That's right, I have become what I have always preached against, the infrequent blog updater!!! And for that, I must apologize! I am deeply full of sorrow for my neglect to the blog-o-sphere. 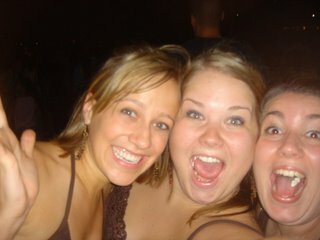 With that said, allow me to update you on 2 memorable nights I've had semi-recently. 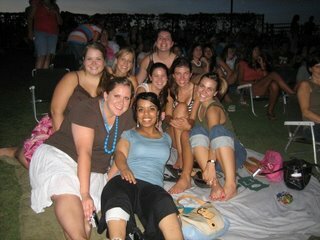 Two weeks ago tomorrow I went with a FAH-bulous group of girls to see Kelly Clarkson in concert. Now some of you may laugh, but I'm gonna have to tell you that it was straight up AWESOME!!! I met up with FUN FUN FUN girls from KXA days!!! (sorry for the over use of exclamation points, but it was soooo fun!) Anywho, KC is super super cute and really good in concert. She's sporting this new haircut, a little short bob, soo cute. Anyways, we had a really great time! Here are some pics! Me and 2 Sarah's soooo excited!!! Group pic, waiting for Kelly to come out! The other night that I wanted to tell you about was last night. All the young ministers and interns (we call ourselves the "Jr. Staff") went swing dancing last night!! IT WAS SOOOO FUN!! The first hour was a class where we learned simple steps, then an hour and a half of free dance! It was super fun! They made you dance with all different people, even ppl you didn't know...it's was cool though! We had a blast and made a great memory! I can't wait to go back! Yay for new experiences and branching out!!! Super Duper: It's been an amazing summer!! !